"Pizza Delivery" is the first segment of the fifth episode of the American animated television series SpongeBob SquarePants. The episode was written by Sherm Cohen, Aaron Springer, and Peter Burns, and the animation was directed by Sean Dempsey. Cohen also functioned as storyboard director, and Springer worked as storyboard artist. It originally aired on Nickelodeon in the United States on August 14, 1999. In the episode, the Krusty Krab receives a call from a customer ordering a pizza, and Mr. Krabs sends SpongeBob and Squidward to deliver it. When the two employees become stranded in the middle of a desert, they get into numerous predicaments. Along the way, SpongeBob tries to show Squidward the way of the pioneers. In pitching the show to Nickelodeon, creator Stephen Hillenburg originally wanted the idea of having the characters on a road trip, inspired by the 1989 film Powwow Highway. However, he eventually gave up the idea, and resurrected it in "Pizza Delivery". The episode received critical acclaim, with most media critics considering it one of the show's best episodes. 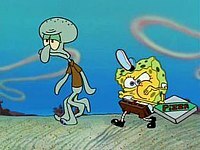 SpongeBob (right) performs a beatbox while he and Squidward (left) deliver the pizza on foot in the middle of a desert after losing their boatmobile. It is closing time at the Krusty Krab, and Squidward answers a last-minute phone call from a customer. Just as he is about to tell them that the restaurant is closed, Mr. Krabs suddenly appears and snatches the phone from Squidward. The customer wants to order a pizza and have it delivered, an order Mr. Krabs happily accepts, knowing that he could earn extra money. Squidward protests this by saying that the restaurant doesn't serve pizza nor do they do deliveries, but Mr. Krabs spontaneously makes a pizza out of Krabby Patties, and tells Squidward to deliver it. Much to Squidward's dismay, SpongeBob eagerly insists that he tag along. After SpongeBob does a few "safety checks" of the delivery boat, Squidward makes him drive. However, SpongeBob cannot drive as he is still in boating school, but Squidward insists by saying "it's just around the corner." He tells SpongeBob to simply do what he does in boating school. SpongeBob tries to shift into reverse, but panics and ends up "backing up" for miles and miles until the boat runs out of gas in the middle of a desert. Squidward complains about this, and eventually kicks the boat out of frustration after SpongeBob mentions that the pizza is getting cold. This causes the boat to suddenly drive back to the Krusty Krab, leaving the two stranded and to continue their delivery on foot. In the process, the duo encounter numerous mishaps: SpongeBob tries a pioneer trick he claims to have seen in a movie where he listens to the ground and hears a truck with 18 wheels coming. But when he tries to get the driver's attention by doing a bizarre dance in the middle of the road, the driver does the complete opposite of stopping by speeding up and nearly runs over SpongeBob. Later, the duo get caught in a violent wind storm that eventually turns into a tornado, and SpongeBob's refusal to let go of the pizza causes them to get sucked into the tornado. However, the pizza saves their lives after SpongeBob turns it into a parachute. Upon landing, Squidward panics when he realizes that the road they were following is nowhere in sight. SpongeBob then notices some moss on a rock, and claims that they should go in the direction that the moss is pointing (another one of SpongeBob's "pioneer tricks"), but Squidward refuses, and goes in the other direction, despite there actually being civilization where the moss was pointing. As they continue walking, SpongeBob constantly sings a song about how the Krusty Krab pizza is the best pizza on the sea floor, which annoys Squidward. The two gradually become tired and hungry, so SpongeBob suggests that they eat coral like the pioneers. Squidward immediately spits out the coral, disgusted by the taste, and demands SpongeBob to hand over the pizza so he can eat it, having finally given up all hope on getting back to civilization. SpongeBob refuses and a short chase ensues between the two. Just as Squidward is about to grab the pizza, SpongeBob notices a giant rock that he claims the pioneers drove for miles. Incredulous at this claim, Squidward tries to tell SpongeBob to forget about the pioneers, saying that there are none left because of their unusual travelling methods. He quickly changes his mind after SpongeBob runs him over with the rock, and they drive it all the way to the customer's house. Unfortunately, things are not looking up too well. The customer is revealed to be Tom (a recurring character throughout the series), who is at first happy that he finally got his pizza, until he discovers he did not get the drink (a Diet Dr Kelp) he claims to have asked for. A confused SpongeBob checks the order, which says that Tom didn't order a drink (although it is heavily implied that Tom didn't order specifically enough or that Mr. Krabs hung up before Tom had a chance to finish). Filled with anger, Tom harshly berates SpongeBob, and refuses to take the pizza or pay for it before rudely slamming the door in his face. SpongeBob goes back to Squidward and collapses to the ground in devastation and cries (while absorbing his tears). Enraged that Tom hurt SpongeBob's feelings by refusing to pay for the pizza, all because of a missing drink (making the long journey and the ridiculous obstacles the duo went through a complete waste of time), Squidward confronts Tom, who arrogantly says, "Another one? Look, I told your little friend I ain't payin' for that!" to which Squidward furiously claims, "Well, this one's on the house!" He brutally slams the pizza into Tom's face as payback for his rudeness. Squidward then goes back to SpongeBob who, still devastated, asks, "Did he change his mind?" Squidward cheers him up by saying, "He sure did. Ate the whole thing in one bite." The two then drive back to the Krusty Krab, which is comically revealed to be right across the street, much to Squidward's dismay, who then says "Oh, my aching tentacles!" as the screen cuts to black. "Pizza Delivery" was written by Sherm Cohen, Aaron Springer and Peter Burns, with Sean Dempsey serving as animation director. Cohen also functioned as storyboard director, and Springer worked as storyboard artist. The episode originally aired on Nickelodeon in the United States on August 14, 1999. Series creator Stephen Hillenburg's original idea for the series pitch was that the writers would write a storyboard for a possible episode and pitch it to Nickelodeon. Hillenburg wanted to write an episode with SpongeBob and Squidward on a road trip, inspired by the 1989 film Powwow Highway. Derek Drymon said "It's a road trip movie starring Gary Farmer, who is an innocent, kid-like character who is traveling with a curmudgeon." Eventually, the idea developed while they were working on it, but Hillenburg gave up the idea for the initial pitch. Instead, they used another idea for the pitch which was in the series pilot episode called "Help Wanted". Writers Aaron Springer and Sherm Cohen resurrected the road trip idea during the first season and used a lot of the ideas for "Pizza Delivery".This episode was also the first one written together by Springer and Cohen, which they would continue to work on episodes together until midway of the first season. "Pizza Delivery" was released on the DVD compilation called SpongeBob SquarePants: Christmas on September 30, 2003. It was also included in SpongeBob SquarePants: The Complete 1st Season DVD released on October 28, 2003. On September 22, 2009, "Pizza Delivery" was released on the SpongeBob SquarePants: The First 100 Episodes DVD, alongside all the episodes of seasons one through five. "Pizza Delivery" received critical acclaim and is frequently cited as one of the show's best episodes. Nancy Basile of About.com ranked the episode No. 2 on her "Best SpongeBob SquarePants Episodes" list. She said "[It] is the perfect episode to depict SpongeBob's enthusiasm for all things Krusty Krab against Squidward's apathy and cynical nature." Basile cited her favorite scene in the episode where "After the customer slams his door in SpongeBob's face, Squidward makes sure he swallows the pizza 'in one bite.'" Giving the episode 5 out of 5 stars, Bill Treadway of DVD Verdict said the episode is his "personal favorite of all the episodes", writing that "this one is loaded with enough unique twists and hilarious comedy to bear repeat viewings." Emily Estep of WeGotThisCovered.com ranked the episode No. 1 on her "Top 10 Episodes of SpongeBob SquarePants" list, saying "But – the pizza is for the customer, and flawless employee SpongeBob won't let Squidward eat any of it." She wrote "[The episode] has the undervalued nostalgia of being episode five of the entire series and it benefits from the aforementioned chemistry of Spongebob and Squidward." She also praised the episode as "an in-depth look at their [SpongeBob and Squidward] relationship, and it set the tone for just how strange the show could be." Estep lauded the hitchhiking dances by SpongeBob, saying "These moves are amusing and charming, while Squidward's bitterness is easy to relate to." In 2009, "Pizza Delivery" was chosen by viewers on Nick.com as the No. 1 episode during a television marathon called "The Ultimate SpongeBob SpongeBash". "The classic setup: SpongeBob and Squidward lost in the desert while delivering a pizza to a customer's home. Squidward just wants to get out of there, but SpongeBob sees his pizza delivery as a sacred oath between himself and the customer. I like when SpongeBob singing to himself - 'The Krusty Krab pizza is the pizza' ...turns into a bizarre gospel jingle singer-'Krusty Kray -ya ya-yaaa-aaab!'" ^ a b SpongeBob SquarePants: The Complete 1st Season. DVD. Paramount Home Entertainment, 2003. ^ SpongeBob SquarePants: The Complete 1st Season ("Pizza Delivery" credits) (DVD). United States: Paramount Home Entertainment/Nickelodeon. October 28, 2003. ^ "SpongeBob SquarePants". TV Listings. Zap2it. ^ a b c d e f Heintjes, Tom (September 21, 2012). "The Oral History of SpongeBob SquarePants". Hogan's Alley. Retrieved September 1, 2013. ^ SpongeBob SquarePants: Christmas. DVD. Paramount Home Entertainment, 2003. ^ Bovberg, Jason (October 6, 2003). "SpongeBob Squarepants: Christmas". DVD Talk. Retrieved September 1, 2013. ^ "SpongeBob SquarePants - Christmas". TVShowsOnDVD.com. Archived from the original on March 4, 2016. Retrieved September 1, 2013. ^ Bovberg, Jason (October 26, 2003). "SpongeBob SquarePants: The Complete First Season". DVD Talk. Retrieved September 1, 2013. ^ "SpongeBob SquarePants - Season 1". TVShowsOnDVD.com. Archived from the original on July 25, 2013. Retrieved September 1, 2013. ^ SpongeBob SquarePants: The First 100 Episodes. DVD. Paramount Home Entertainment, 2009. ^ Lacey, Gord (September 29, 2009). "SpongeBob SquarePants - The First 100 Episodes (Seasons 1-5) Review". TVShowsOnDVD.com. Archived from the original on September 21, 2013. Retrieved September 1, 2013. ^ Basile, Nancy. "Best 'SpongeBob SquarePants' Episodes". About.com. Retrieved September 1, 2013. ^ a b Treadway, Bill (November 10, 2003). "SpongeBob SquarePants: The Complete First Season". DVD Verdict. Archived from the original on September 21, 2013. Retrieved September 1, 2013. ^ a b c d e Estep, Emily (December 5, 2011). "Top 10 Episodes Of Spongebob Squarepants". WeGotThisCovered.com. Retrieved September 1, 2013. ^ "Pizza Delivery". The Ultimate SpongeBob SpongeBash. July 17–19, 2009. Nickelodeon. ^ "SpoongeBob SquarePants: Tom Kenny's Top 20". iTunes. 2009. Retrieved April 10, 2018. Wikiquote has quotations related to: "Pizza Delivery"
"The Sponge Who Could Fly"
"Have You Seen This Snail?" "What Ever Happened to SpongeBob?" "SpongeBob SquarePants vs. The Big One"
"To SquarePants or Not to SquarePants"
"The Legend of Boo-Kini Bottom"
This page was last edited on 23 March 2019, at 03:55 (UTC).